The Girl from the Other Side has always had some horror elements mixed into it. In volume five Japanese manga artist and writer Nagabe dials up the horror a couple of notches and introduces some truly unsettling new ideas. At the end of volume four we see Auntie, who has fallen victim to the curse, begin to lose her memories of Shiva and her previous life as a human. Auntie is lured into the woods by another Outsider. Teacher and Shiva go looking for her out of concern and find... just her skull. In the opening pages of volume five, we find out what happened to her. An Outsider tells them that every cursed 'black child' exists to fulfil a certain purpose but as time passes they begin to lose their voices, their bodies, their memories, their sense of duty and then once all of that is gone they shed their physical bodies and turn into trees. This is the only way they can be free of the curse, Teacher and Shiva learn. The curse rots through the soul of someone who is cursed. Some people are more vulnerable to the blight than others and will not last that long as a black child, which is what happened to Shiva's beloved Auntie. This horrific revelation comes as a shock to Teacher who wasn't aware that turning into a tree was a thing that happened to Outsiders and demands to know why it hasn't happened to him yet. He learns that his soul was not as pure as Auntie's, so he will last a lot longer as an Outsider. This frightens him to his core. What a cruel fate awaits the cursed. It doesn't seem fair what is destined to happen to them. Shiva's reaction to this news is heart breaking. She falls to her knees in front of Auntie's tree and finds a picture she drew sitting at the base of it and notices that Auntie's dress is tangled in the branches. She knows it is true then. This tree used to be her Auntie. She is devastated. But what upsets her more is that she finds out Teacher knew that Auntie was losing her memories but he neglected to tell her. There was a lot that I liked about volume five of the Girl from the Other Side. It had some excellent illustrations in it. One of my favourite pages was the front cover. It showed Teacher and Shiva sailing across a black and glassy looking lake in a small wooden boat against a white backdrop. It is raining, you can see their reflection in the water beneath them, a black crow is following them and some bone-white hands are sticking out of the water. It is a great example of how Nagabe uses black and white to create a creepy and haunting feel in the Girl from the Other Side. I really liked how Shiva and Teacher's relationship develops in this book. The two of them have an argument over Auntie. Shiva kicks Teacher out of her room and barricades the door with her bed and other bits of furniture. Teacher tries to force his way back in but Shiva refuses to open the door. A verbal argument breaks out between them where they both call each other a number of names. It was an adorable father-daughter scene. 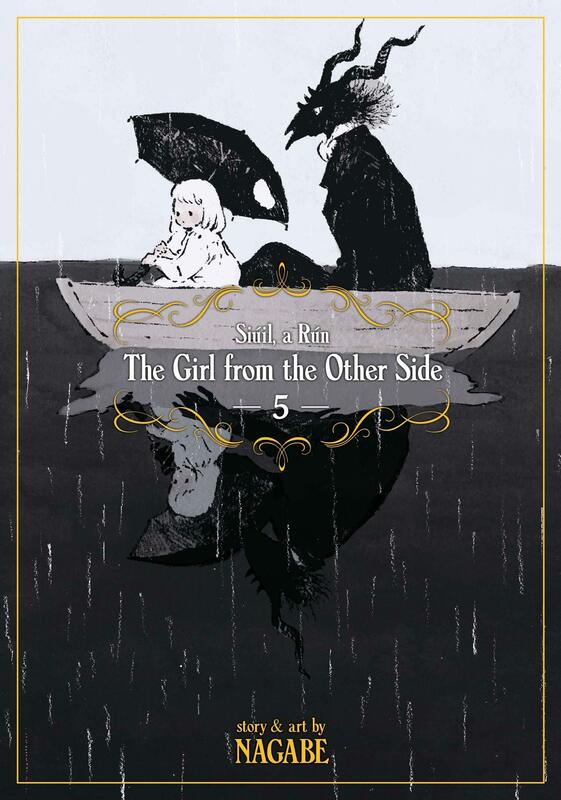 I am really interested to see how the Girl from the Other Side continues to develop. What is so different about Shiva? Why does she still look human? And why is Teacher not as vulnerable to the curse? Is there any way for people who turn into trees to revert back to their human forms? Will we ever see Auntie again? Why? Teacher’s worst fears about Shiva are confirmed and little Shiva learn what happens to her beloved Auntie.